Wowza ... the gallery for the Scandinavian Christmas prompt was A-Maz-ing ... choosing only three to feature this week was a very difficult task ... we loved them all so much. 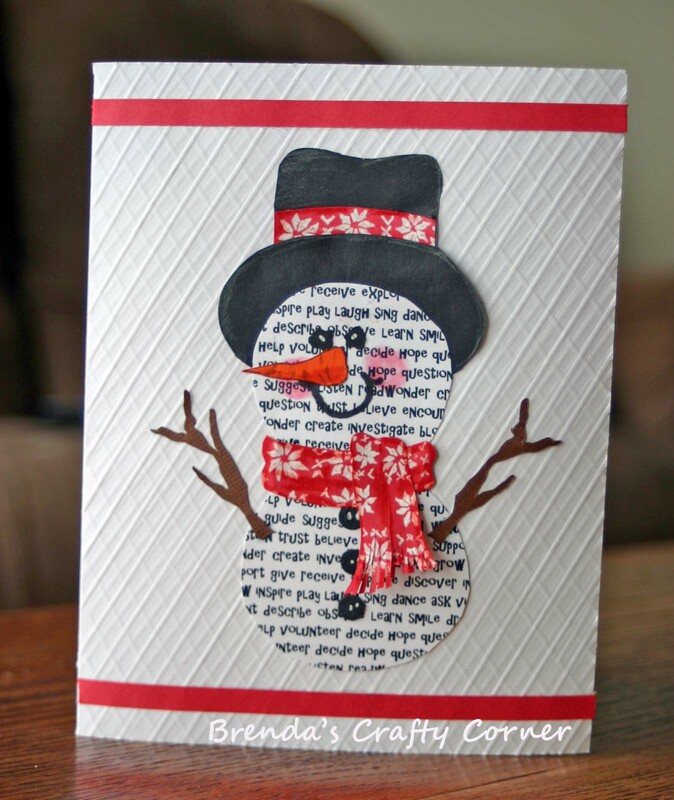 When we saw this texty snowman, we fell in love ... but when we read the description of how she hand-cut all of the elements and used a white gel pen to draw the Scandinavian Snowflake pattern on the scarf and hat band, we were jaw-droppingly amazed. 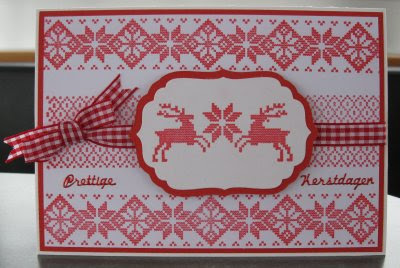 The stamping on this Scandinavian inspired beauty is perfection ... such a lovely combination of elements with the checked ribbon adding the perfect finishing touch. 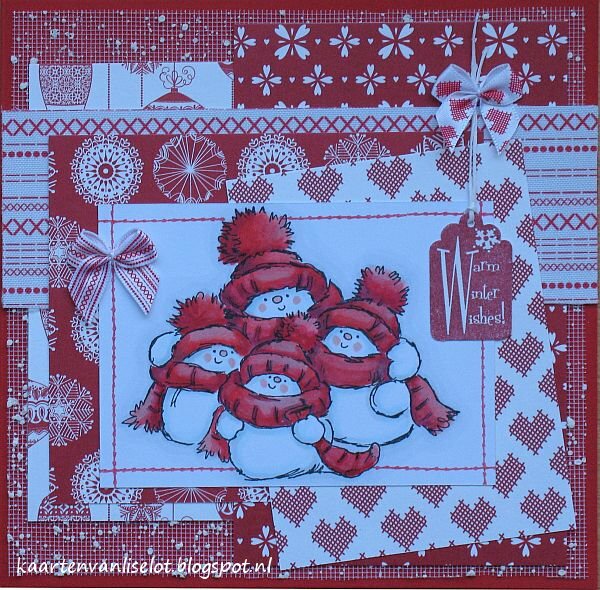 This snowman quartet is colored beautifully (love those rosy cheeks) ... and the combination of patterned papers is perfection ... a true Warm Winter Wonderland. Make sure you join us at midnight for another fun prompt and super-lovely guest star. We're still making cards inspired by our Scandinavian Christmas picture this week. Lauren says, "i have a confession to make: i'm not actually in love with my card this week. i love all the elements... (especially the border, which i had a great fun designing and hand-stitching!) ...but somehow the card itself just doesn't quite "gel" for me, despite the fact that i used this week's awesome retro sketch #47 for the layout. however, the very best part of making my cards one-per-week all year long, is that i will have 48 done by december first, and if even 50-75% of those are FAB, i will consider my year very well spent. so am i gonna throw this one out and start over? no way! because, there is NO SUCH THING as a "bad" handmade christmas card; every single one is full of our love and creativity, and thus someone will appreciate seeing this one in their mailbox over the holidays!" 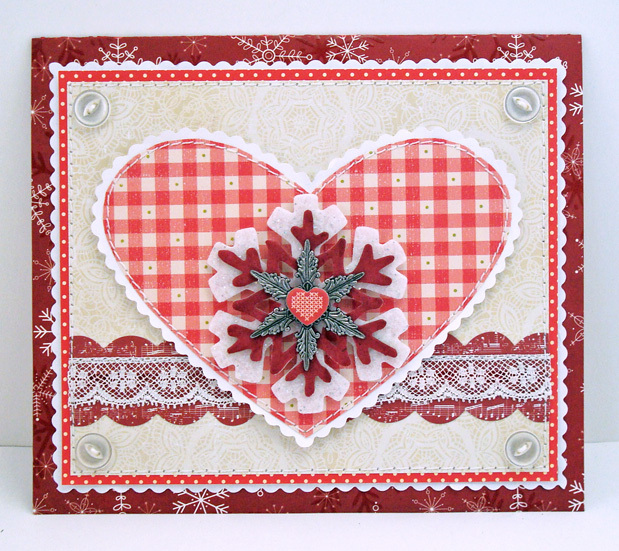 Stephanie says, "The elements I wanted to incorporate from the photo this week were the aged metallic texture & a heart. I embossed metallic silver cardstock & then rubbed on Black Soot Distress Ink to age it. 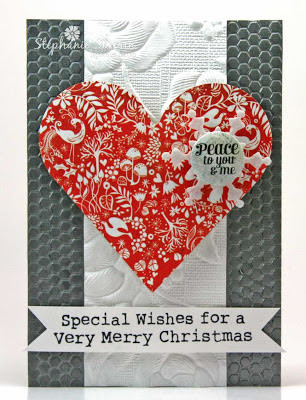 I die cut the heart from Basic Grey Nordic Holiday paper & attached with several layers of foam so I could shape the heart for dimension. 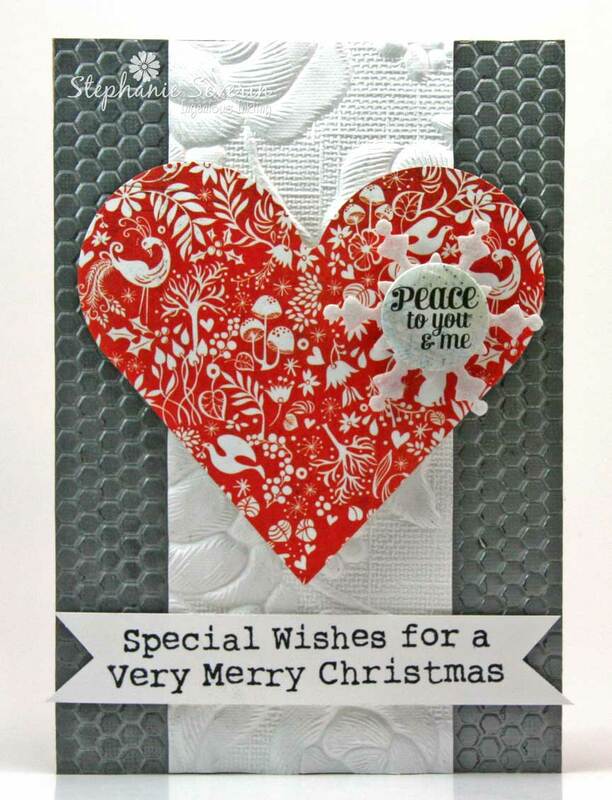 I added a scrap of embossed paper incorporate the texture of fabric to the design. I finished with a felt snowflake, Aspen Frost Flair, and Hero Arts Get Merry! sentiment." Remember, you have until Wednesday, January 30th at 6pm EST to link-up your cards ... can't wait to see what you create! 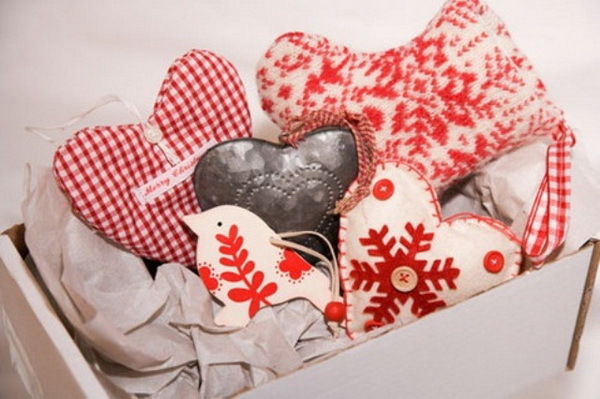 This week we're celebrating the Red, White & Jul ... and bringing you a picture of some Scandinavian Christmas Ornaments to inspire your designs ... maybe you'll be inspired by the colors, the shapes, the grouping of elements ... just go with whatever makes you excited to create. 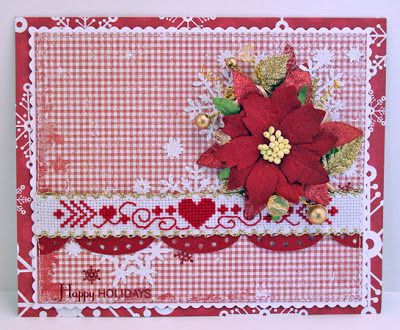 Stephanie says, "When I saw the picture, I knew I wanted to use red felt Stampin' Up snowflakes I've had in my stash for some time. 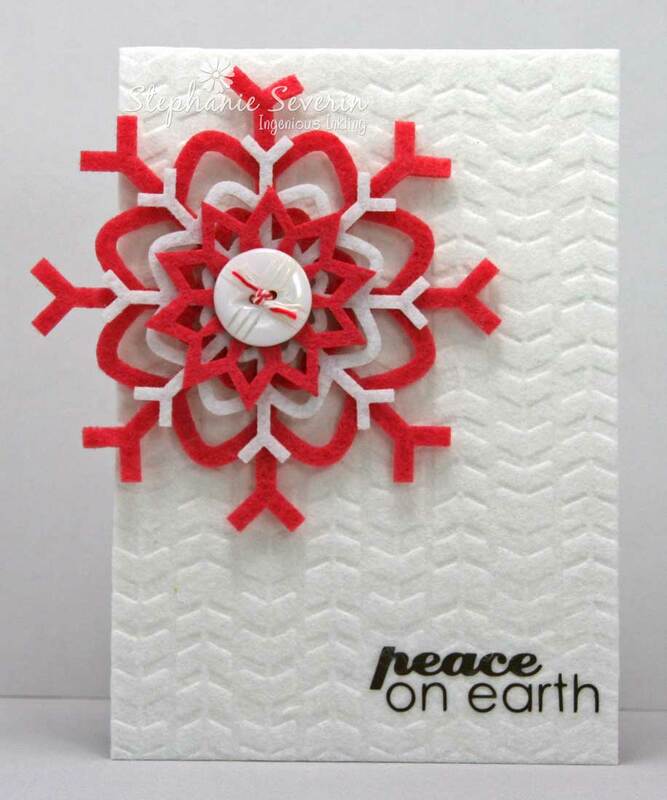 I layered several with a white felt snowflake and vintage white button (tied with red & white twine). I wanted my background to have the softness of the fabric in the inspiration photo ... so I embossed a piece of adhesive white felt and love the sweater-like effect. I also loved that I was able to adhere a rub-on directly to the felt." Lauren says, "i actually thought *I* had some red felt snowflakes, too, but i was wrong; all of mine were the traditional white, darn it! :) so i used one of those, and colored a plain chipboard flake with a red sharpie marker, instead. 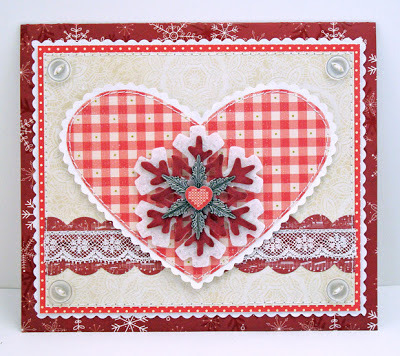 then i realized i DID own products which could duplicate many of the other elements i loved from the photo, so i loaded them up: gingham heart, vintage buttons, a little bit of metal, and finally a bit of lace and some machine stitching to give the feeling of fabric, even though i've used paper for 99% of my card!" And in case you don't have anything in your stash that you think will work, here's a link to some awesome Good Jul tags you can incorporate into your design. 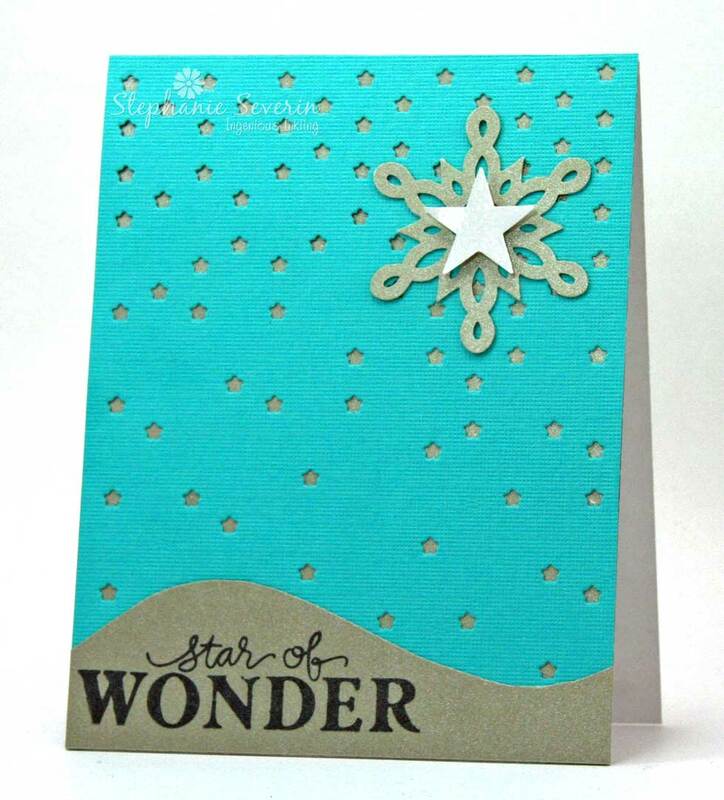 So keep that holiday card production going in 2013 and show us your inspired creations. Be sure to link-up between now & 6pm (EST) on Wednesday, January 30th ... keyword for galleries & our flickr group is JB13-2. putting the GOOD in "goodies"!!! 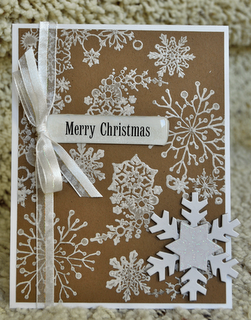 inked and embossed some brand new christmas-present snowflakes on a kraft background; proving that you only need a few well-chosen ingredients to create a stunningly lovely effect! 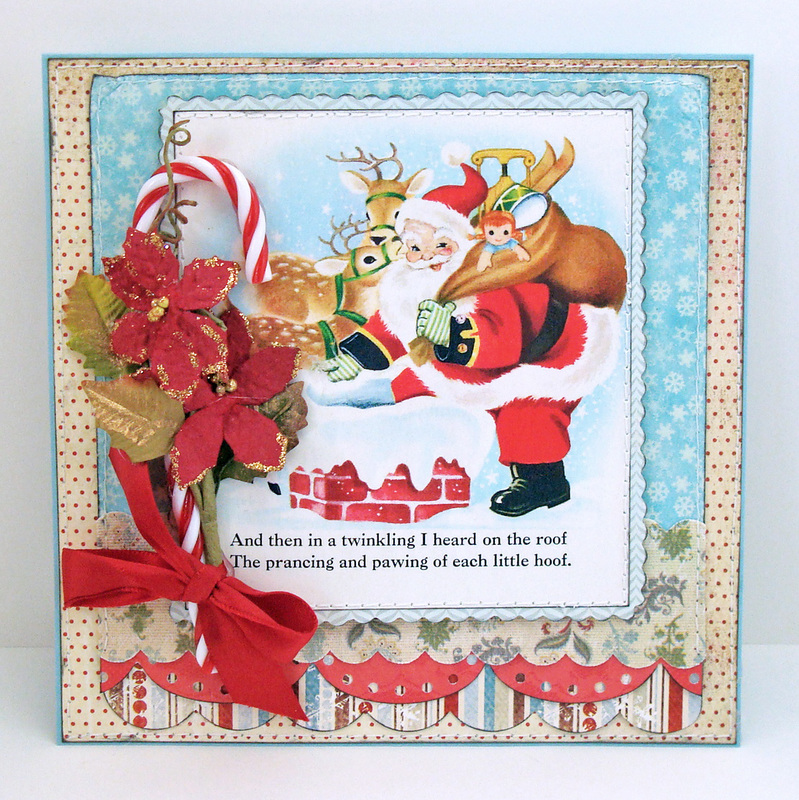 stamped, masked, inked and glittered to perfection in this card which brilliantly highlights a beautiful sentiment from her secret santa! 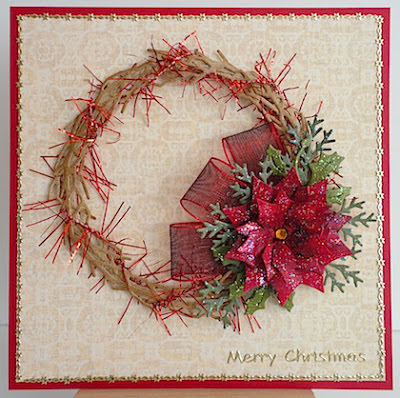 added a lusciously glittery poinsettia, intricate foliage, gorgeous ribbon and fancy fibers to a beautiful grapevine wreath die she treated herself to this christmas! will be receiving a little package in the mail, just as soon as she emails us (jinglebellesrock @ hotmail [dot] com) with the address to which we should send it! Santa really was *GOOD* to us this year! And thus we have a few MORE goodies to show off! 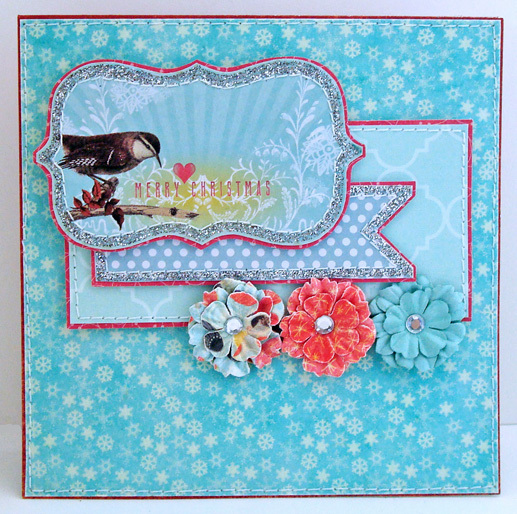 Lauren says, "i'm not sure i've ever posted two cards in a row with the same background paper, but what can i say? i just *LOVE* that blue mulberry with the snowflakes! it's also (imo!) the perfect background for my favorite christmas present to myself: those gorgeous holiday glitter stickers from the papaya art blog. the florals are new, too, they were a "crafty steal" just before the holidays and this is their first time out of the packet!" 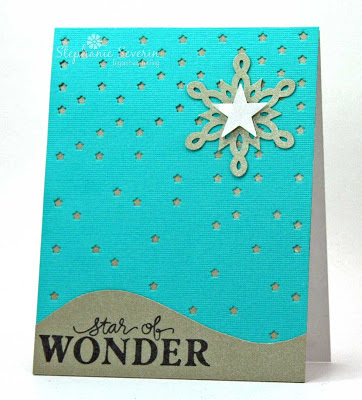 Stef says, "Lauren & I never know what the other is making until we upload our cards to the blog each week ... so I had to smile when I saw that we used the same *new* product for our design. We both have a serious weakness for Papaya Arts ... and Santa Lauren gifted me with some of these amazing glitter stickers for the holidays. I used both the larger and smaller peace stickers with My Mind's Eye Vanity Fair papers. 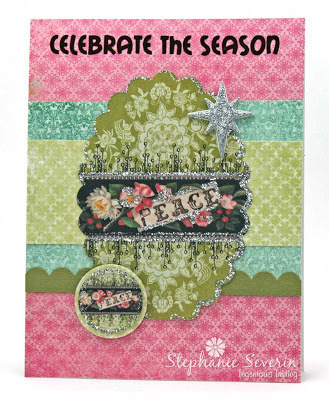 To finish, I added a glittery star & EAD Designs rub-on. 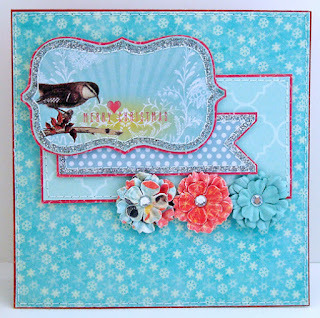 The layout is this week's Sweet Sunday Sketch." 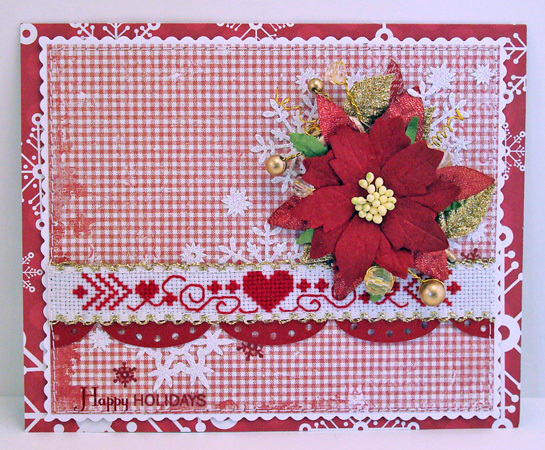 For the very first ♥JINGLE BELLES♥ prompt of 2013, we're celebrating all things new, and using them to create our first holiday cards of the year. Specifically, we're asking you to gather up the new crafting goodies you received for the holidays, use as many as you'd like on a card, and then link it up below! Just in case all you got from Santa was a bag of coal, then break out something from your crafting arsenal that you haven't created with yet; OR, if you have absolutely NOTHING NEW* with which to create, we suppose you'll have to use this as a wonderful excuse to treat yourself to a little something from the post-holiday sales! ;) Be sure to tell us in your description what fun new items you are using, so we can all be suitably envious! 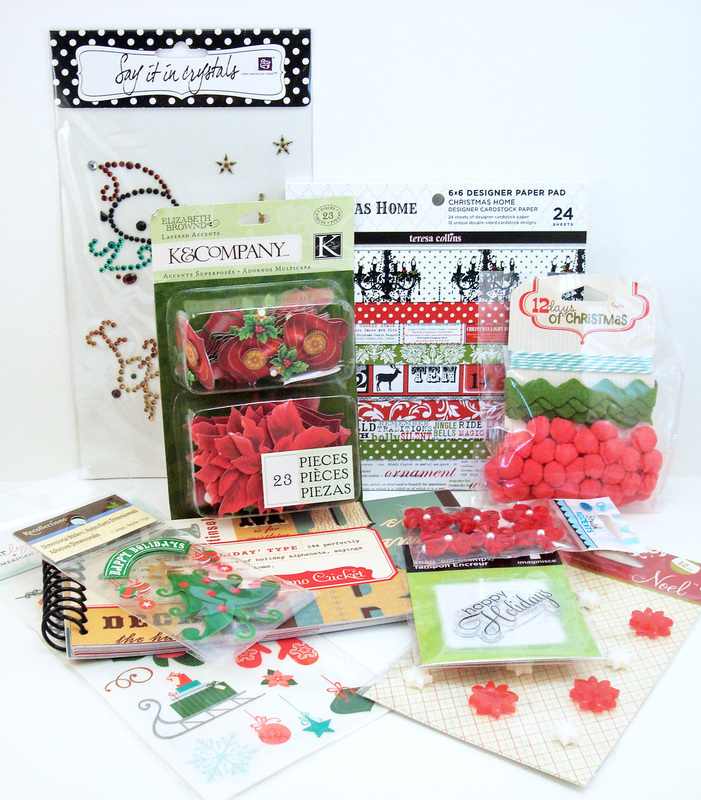 Stephanie says, "My mom bought me several goodies of my holiday wish list including this wonderful falling stars craft die. I paired it with a punched snowflake & star; shimmer & glitter papers; and sentiment from Merry Everything for a relatively quick holiday card. Lauren says, "i was lucky enough to receive quite a few crafty goodies from various lovely friends and family members; too many even for *ME* to put on just one card, lol! but i squeezed in as many as possible, including that gorgeous and almost-real candy cane from ros; a slightly reduced color-copied-page from a vintage "night before christmas" book from gina (she knows i collect them! ); some gorgeous basic grey "kissing booth" papers from stephanie; holiday mulberry paper from my prima's "12 days of xmas card" prize; and finally some not-so-new but still very treasured webster's pages fabric ribbons which leslie gave me, last spring!"